If you subscribe via RSS, you don't have to do a thing. I will keep this blog as an archive for a while. Check out the new blog and let me know what you think. There are different ways to close the loop between social media and offline action as we get better integrating social media into our overall marketing and communications plans. 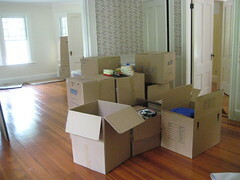 Think in both directions - offline to online and online to offline. And, remember it is important to track your tactics to see which ones work. 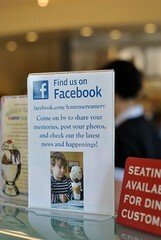 I was in Oakland, CA and discovered Fenton's Creamery, famous for its ice cream. The line was out the door. Lines are good because you can contemplate that important decision: What flavor? While I was debating between chocolate chocolate chip and coconut pineapple 95% fat free flavors, I noticed a small sandwich board sign promoting Fenton's Facebook Page. I "liked it" from my iPhone. I posted the above photo on my Facebook page, primarily to test how different content sparks interaction on my own Facebook page. But as a bonus, I learned from Facebook expert Mari Smith, that sandwich boards and window clings with Facebook and Twitter IDS are an effective technique to close the loop between offline and social media. In the nonprofit world, we've been focusing on the online to offline connection, or more specifically how to turn Slacktivists into Activists with Social Media. This excellent post by my business partner, Geoff Livingston, provides some excellent tips for encouraging deeper engagement from your nonprofit's online social media friends and fans. This year, we are seeing the twin trends of greater awareness from nonprofits for the need to integrate social media with existing marketing and communications plans while at the same time audiences are yearning for greater social media engagement from the charities and causes they love most. This could be a win-win situation for your nonprofit organization if stop thinking of your social media channel in a silo. What are you doing to encourage offline ---> online action and what are you doing to encourage online--> offline action? How are you tracking your efforts? 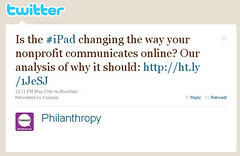 Do Nonprofits Need To Consider iPads in their Mobile/WebStrategy? So after a good report card, I acquired an iPad. 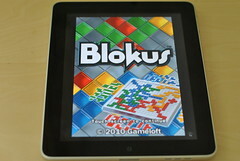 Right now we're using it to play Blokus, a game that we have played together as family for years in its analog form. The game teaches strategy and visual skills. The iPad version lets you play against the CPU, in tournaments, alone, and with others, including multi-players. It has a coaching mode so you can improve strategy. I also found a coloring and drawing app that my daughter is enjoying, although I must admit that I'm having fun with it too. The device isn't just a toy for the kids (or me.) I also have been exploring the iPad professional uses. So far, it is useful for note taking, live tweeting at conferences, and checking email on the go. I also admit that the first app I downloaded was one for google analytics - it's great for browsing data. Most of all, I like using it to read web content over coffee away from my desktop. I like it better than my smart phone because I don't need 300x reading glasses to read the screen and it is nice and light. Organizations that think about how they can build an experience that truly captures their missions will have an advantage in attracting people who use tablets. While acknowledging that thinking about integrating iPad apps is something that isn't yet widespread, the Chronicle is wondering what iPad apps early adopter nonprofits are working on for constituent engagement? This might be something along the lines of an interactive game that engages people around a cause. I ran into Peter Conlon, the CEO of Ammado, an online giving platform, was eager to not only show me his iPad, but that one could make a donation online using their widgets. One area of iPad development are "productivity" or "enterprise" apps that allow users to link back to a CRM or other database. Computerworld wrote about enterprise apps mentioning one from Blackbaud. 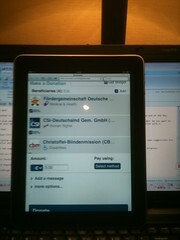 So, not only is there front-end, but there is also a back-end, which assumes that the nonprofit has the iPad. There is also another area for development and that is iPad apps for program/service delivery. Take for example this app that allows deaf people to test their hearing. Or VolunteerMatch which launched an iPhone and iPad app recently. Amid the hype around the iPad and apps, there will be lots of potential ways that nonprofits could use iPad apps to support their missions - from engagement, fundraising, enterprise and program delivery as there is more widespread adoption by end users. Right now, nonprofits should recognize that we're still in the early stages and there's no compelling rush to get seduced by shiny object syndrome. What's your take on iPads and Nonprofits? Note from Beth: I first encountered Nina Simon through her awesome blog back four or five years ago. I got a chance to meet her face-to-face for the first time at the Nonprofit Technology Conference in 2007. I'm a huge fan of work and the way she thinks - especially after she road the Scare House ride on the Santa Cruz boardwalk with me and did a brilliant reflection on its design. 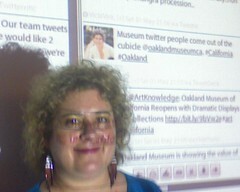 Nina has written a fantastic book engagement called The Participatory Museum. I've purchase a two copies, one for me and one to give away. If you want a chance of winning a copy, leave a comment saying how you might apply some of the science of participation to your social media strategy. Imagine sitting around a conference table planning an upcoming project that involves user-generated content. One colleague suggests that users should be able to contribute original work. Another thinks that users should not only contribute content but also have a hand in determining how it is used. A third argues that the project won’t be truly participatory unless users get to define what content is sought in the first place. How can you describe user participation in a shared language that helps your team make the right decision for your project? Science has an answer. Last year, Rick Bonney and a team of educators and science researchers at the Center for Advancement of Informal Science Education (CAISE) tackled this question in a project designed to define the structures and benefits of public participation in science research (download the full report as a PDF here.) As far back as the 1880s, scientists have led “citizen science” projects in which amateurs are invited to participate in formal scientific research by volunteering to count birds, measure soil quality, or document non-native plant species. Despite its long history, few researchers studied the use and impact of citizen science until the 1980s. 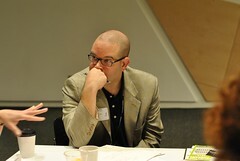 Over the course of several projects at the Lab, Rick Bonney and others noted that different kinds of participation led to different outcomes for participants. When participants collected data, they learned a great deal about data collection processes but not so much about the overall scientific method. When, on the other hand, amateurs had the opportunity to help design scientific questions or disseminate research results, they often felt more ownership of the project and greater interest in using scientific methods to address their own community needs. Rick wanted a better way to describe what kinds of projects led to different community outcomes. After a broad survey, Rick’s team defined three broad categories of public participation in scientific research: contribution, collaboration, and co-creation. These categories align roughly with the extent to which the public are involved in different stages of scientific research. In contributory projects, participants collect data in a scientist-controlled process. Scientists design the test questions, steer the data collection, and analyze the results. In collaborative projects, citizens collect data, but they also analyze results and draw conclusions in partnership with the scientists. In co-creative projects, the public develops the test questions, and scientists co-produce scientific regimens to address the community interest. While co-creative projects have the most lasting impact on participants, they tend to involve very small groups of participants and require a lot more work (and flexibility) on the part of the scientists who run them. What does this have to do with nonprofits and social media? Like science labs, nonprofit organizations produce public-facing content under the guidance of authoritative experts. Like citizen science project leaders, many social media practitioners are seeking meaningful, sensible ways to invite users, customers, and citizens to participate in the development of high-quality work. I’ve been using these participatory categories to talk about how we’d like users to participate in different projects. 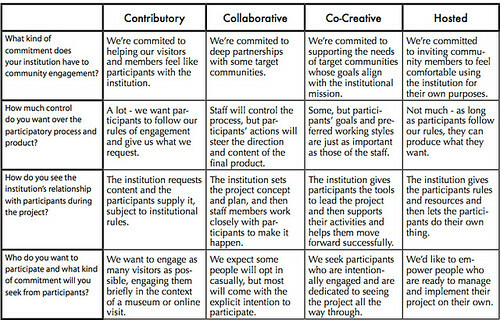 Most of my work involves museums, but these categories can be useful in any project that involves user participation. I’ve added one more category to the mix called hosted. Hosted projects are ones in which an organization turns over a portion of its facilities and/or resources to present programs developed and implemented entirely by users. This category is in some ways the most radical, because the organization is only minimally involved in the use of its content—but it is also potentially the most powerful for users, who can appropriate the content for whatever suits them. • In contributory projects, users are solicited to provide limited and specified objects, actions, or ideas to an institutionally controlled process. Blog commenters are contributors, as are people who engage in contests. The Victoria & Albert Museum’s World Beach Project is a wonderful contributory project in which people around the world make artworks on beaches per institutional specifications and submit images of their work to a central website. Participants feel like part of something bigger than themselves, but they don’t connect to each other personally as community members. • In collaborative projects, users are invited to serve as active partners in the creation of institutional projects that are originated and ultimately controlled by the organization. Wiki users are often collaborators. They have some influence over the direction of the project but don’t steer it themselves. In the US Holocaust Memorial Museum’s Children of the Lodz Ghetto research project, participants work together with staff to do database research into the lives of thousands of Polish children during the Holocaust. Users report incredible connection to each other and to the project, but quality control is much more complex than in a simplified contributory project. • In co-creative projects, community members work together with institutional staff members from the beginning to define the project’s goals and process based on community interests. Online, this may be a campaign that is started by a member and then supported and fueled with institutional help. In the physical world, at the Wing Luke Asian Museum in Seattle, staff members partner with visitors to co-produce exhibits based on community members’ interests and the institution’s collections. The resultant exhibitions are beautiful and well-received, and the institution accepts that the community process takes more time, effort, and humility than a standard exhibit design process. • In hosted projects, users appropriate institutional content or resources for their own uses. Online, this may mean participants creating their own mashups or using organizational data to construct visualizations. When the Toronto Science Centre hosted the 888 YouTube Meetup, museum staff effectively invited YouTubers from all over the world to use the facility as a videographer’s playground. This generated many energetic videos set in the Science Centre, but many featured content that was not in-line with the institutional mission. Contribution, collaboration, co-creation, hosted. No one model is better than the others. Nor should they even be seen as progressive steps towards a model of “maximal participation.” They each imply different levels of institutional control and participant involvement, but transformational experiences are possible in every type. Consider the difference between a book project in which an institution sources stories from users (contributory) and one in which the institution works with a small group of users to design the publication (collaborative). If the first project results in a book composed entirely of users’ voices and the second results in a volume that looks more like a “typical” institutional publication, which project is more participatory? This question is impossible to answer, and for good reason. Participatory projects are most successful when you can find the right model for your staff culture, your users, and your goals. Here’s a chart that may help you figure out what type is best for your next project. While there are outlier innovative projects that defy categorization, this chart displays the fundamental characteristics of each model. How will you invite participants to engage with your next project? 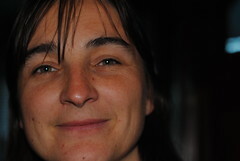 Nina Simon is an independent museum exhibit designer and publisher of the Museum 2.0 blog. She is the author of the new book The Participatory Museum, a practical guide to visitor participation in cultural institutions. I was lucky enough to get two copies of Engage! by Brian Solis. So, I'm giving away a copy on this blog. To be eligible to win, leave a comment (be sure to include your email address). The book is a comprehensive collection of philosophy and advice on social media, strategy, brands, and business integration. What I appreciate are the info graphics that accompany most of the chapters. 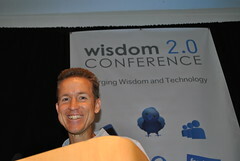 Brian has collaborated with Jesse Thomas over the years to produce compelling visuals of ideas. One you may be familiar with the Conversation Prism that has probably appeared in more powerpoint presentations about social media than any other graphic. 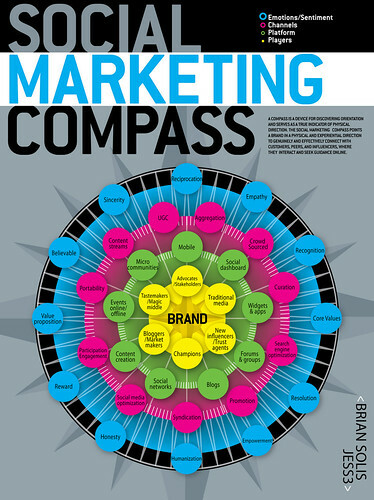 My favorite part of the book is Chapter 21: The Social Media Marketing Compass: Creating A Social Plan. "A Social Media Marketing Compass points a brand in a physical and experiential director to genuinely and effectively connect with customers, peers, influencers, and where they interact and seek guidance online." Jesse Thomas created the information graphic below to illustrate the full concept. The book contains a detailed explanation. The brand is at the center. The concentric circles include players (stakeholders); platforms which are places where people connect online and off; Channels (activity on platforms) and finally Emotions. The Social Media Compass is a concept, the chapter also presents a framework for creating a social media plan. 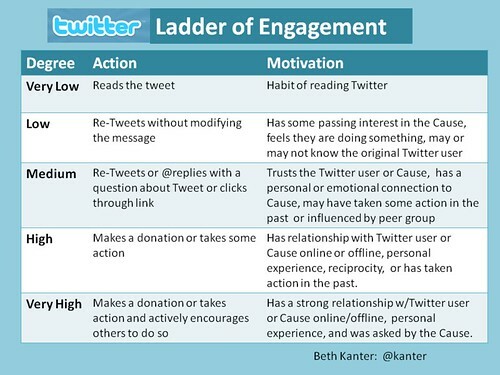 With all fundraising and activist campaigns, I think it is important to think of your conversation and messaging strategies in the context of the Ladder of Engagement - whether you are focusing on one campaign or your fundraising campaigns for the whole year. Think about all the various ways your organization interacts with different groups of people through its communications and fundraising efforts – through social media or other traditional channels. You will no doubt discover that some people engage with you lightly and others will engage with you more deeply. Face it, not every single person your organization touches will have the same level of passion or interest in your program. And, that is not a problem, it’s just the way it is. To be successful integrating social media into your fundraising channels, you need to use different techniques, tactics, and tools to map to the person’s level of interest. You need a portfolio of approaches or maybe even campaigns that meet people where they are at and help get them more engaged with your cause and organization. 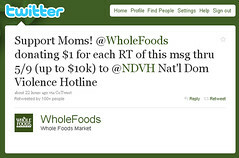 The Whole Foods sponsored Re-Tweet donations is focused on a lower level of engagement, simply spreading the message. This type of campaign is a win-win for sponsors and for nonprofits that need to boost awareness of their issue and have just started dipping toes into the social media waters. What is missing is some mechanism for the the nonprofit to reconnect with those who are Re-Tweeting the message and engage and educate them, perhaps getting them to the point of making a donation, volunteering, or signing up for a newsletter. My colleague, Geoff Livingston, recently wrote an analysis on Mashable about Twitter's new social good initiative Hope 140. The first effort was the #EndMalaria campaign that used the TwitPay platform for donations, creating a combined call to action that asked Twitter users to retweet by donating $10. The Case Foundation matched donations with a $25,000 grant. The effort raised over $11,000. Another example of this combined called to action comes from Epic Change and its "To Mama With Love" their call to action focuses on donating and user-generated content. What I think has made this campaign catch on is that it is powered by love or an emotion we feel for our mothers or being a mother. Also, Tweetsgiving has been building and cultivating a network and has now has a cadre of people who at the highest level of engagement and while to encourage peers to participate. The campaign also helps us save a universal problem - what should we get our mother's for that special day? It is important to understand that these levels of engagement are part of an ecosystem. While fewer people may reach the very highest levels of engagement because of the time commitment, personal connection, or interest, those with lower engagement are important to ecosystem because they spread awareness. Recognize and appreciate people where they’re at, and work to get more people engaged as you strive to gently nudge them further up the rungs of your ladder. This takes a combination of tactics and approaches - from one-on-one relationship building to more broadly spreading your message. You need also take into account where you are in developing your network at all times and be nurturing those higher levels of engagement outside of campaign mode. You also need metrics and measurement to see what works in terms of moving people up the rungs! What is your repertoire of engagement techniques to inspire people to move up the ladder? Are you thinking about it one campaign at a time or an going activity that includes campaigns? How do you balance your social media strategy so it includes both low and high levels of engagement? 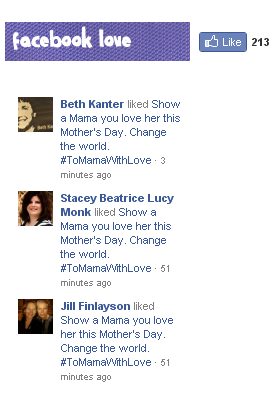 Epic Change has launched a clever social media infused fundraiser for Mother's Day, called To Mama With Love. Leveraging the emotional connection we feel with our own mothers or our own pride of being a mom, Epic Change is inviting donors to participate in an online collaborative art project to honor moms around the Globe. The fundraiser's goal to is to raise money for one amazing Mama who dreams of building a home for children in her village in Africa. The money you donate to this effort will support Mama Lucy Kamptoni, a changemaker in Tanzania who once sold chickens and used her income to build a primary school that now provides a high-quality education to over 400 children in Tanzania. The money raised from this fundraiser will help build a boarding facility on campus so that every child who attends her school has a place to call home. To Mama With Love is a project of US 501c3 nonprofit Epic Change. Here's how it works. You have to make a donation first. Then once you've donated, you can create a special heartspace in honor of your mother or a mother you admire. You are given the option to customize your "heartspace" with photos, video, poems and artwork. The program creates a mini-web page with a unique URL that declares your love. 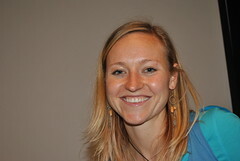 According to Epic Change's founder, Stacey Monk, the web site was created by volunteers that included developers who are students from CMU (where Stacey attended school) and a designer in London whose parents come from a village one hour from Mama Lucy in Tanzania. I love the design. To help spread the word, the site has integrated "sharing" your love for your mother and Mama Lucy both on Twitter as well as on Facebook (or should I say sharing your "like"). For Facebook, they're using one of the Facebook social plugins. What are you doing to honor your mother on Mother's Day and help change the world? If you are a mother, how are you celebrating your special day and making the world a better place? Note from Beth: During my trip to India in February, I was introduced to a nonprofit children's book publisher in India, Pratham Books. “It was set up to fill a gap in the market for good quality, reasonably priced children’s books in a variety of Indian languages. [Its] mission is to make books affordable for every child in India.” I was impressed with how Pratham Books has used social media to reach out to children in rural areas who are the "Bottom of the Pyramid." In ongoing conversations with John Gautam on Twitter, I've learned more about how their overall social publishing strategy which balances their curated content or "branded" content with community conversations to co-create social content. He offered to write a guest post sharing more about how their social publishing strategy. India has a reading problem and the problem is two fold. The first part of the problem is that India still has low literacy rates - the 2009 Annual Status of Education Report shows that between classes 1 to 8 only around 40% of children can read a class 2 level text in their own language and an even lower 23% of children can ready easy sentences in English - sentences of the kind "What is your name?" That said, there are wonderful organizations working with State Governments to improve literacy and reading levels across the country such as Pratham and the Akshara Foundation and much progress has been made. However, once children learn how to read it is crucial to sustain their interest by cultivating a reading habit and while the aim was to provide a book in every child’s hand and a library in every neighbourhood we found that there was a dire shortage of high-quality, low-cost children’s books. 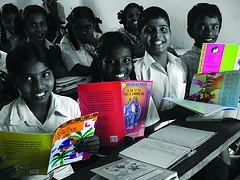 To fill this gap that existed in the market, the Pratham Books Trust was registered in January 2004. Since then, we have published and shipped over 8.5 million books, 10 million storycards and have reached over 8 million children. While that in itself probably qualifies us as one of India's largest children's book publishers, when compared to the scale of the problem - over 300 million children in India - it is still a minuscule effort. We began our journey two years ago while trying to figure out a possible catalytic approach to the children's book publishing space. First, we have our goal which is a book in every child's hand. And logical corollary to that, that the books should be in a language the children read. Second, we looked at the problems that the market currently faces, lack of scale, lack of languages, lack of content, lack of reach and expensive distribution channels. Hence, our three primary, social media or social publishing, aims are to increase the nett content available, reduce the cost of each book and to go beyond the traditional distribution networks in a large way. This is crucial if we all believe in "A Book in Every Child's Hand" and consequently, it implies the need to create alternate channels of creating and reaching books to children. An important ingredient to our strategy was building a community around our mission. As an adjunct to this, we realised that what we had was content, lot of it and very valuable content, that we could use to form a community around. We have since used our mission and our content to establish conversation based around a larger "reading" mission and over time and with sustained engagement, hope to build some sort of loyalty and trust within the community we curate. Blog: A resource which talks about publishing, reading, literacy, kidlit, learning, non-profits, events and more. Twitter: A space where we can engage with the community, share ideas, ask for help, get feedback, listen to complaints, participate and mobilize people to help us with our vision of ‘a book in every child’s hand’. Scribd: Uploading our books frequently so that they can be read by more people. Also, for our Creative Commons licensed books to be remixed/repurposed by the community in whatever way they wish to. YouTube: Documentation of our work and to inform people about some of the initiatives we are participating in. Also to inform people about our books through book trailers. 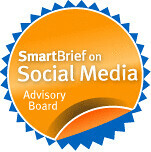 Our strategy has relied upon being part of a larger mission, providing meaningful and valuable content, curating information and content for the community, using a legal framework that allows for a participatory culture and lastly, in time, providing a space for the community to assist in the mission by creating content themselves. The last part, a community publishing platform, is something we are working on with the Connexions Project and a brief video about it is here. Example of Partham Books on mobile phones. What we've found is that honestly, transparency and accountability are the three most important elements of any social media strategy. A longer case study that we had written up is available on the IndiaSocial site. 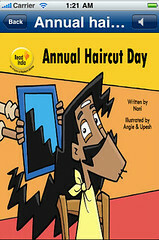 John Gautam works for Pratham Books is a non-profit trust that publishes high quality books for children at affordable prices and in multiple Indian languages.